cyberpunk future world of the classic Syndicate. Classic Beat ‘em up action! Hit the streets and smash, punch and kick evil gangsters in this epic side scrolling brawler. 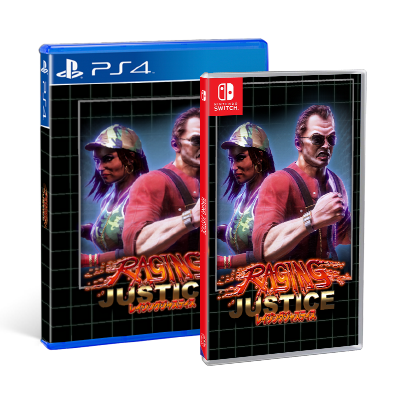 In Raging Justice you are a cop and must decide whether you want to play by the rules or take the law into your own hands, unleash your wrath upon the criminals and become Raging Justice. Available from Sunday, 31. March 2019. Carefully selected console games for PS4 and PS Vita that we love to play ourselves. And great collectibles. All games we publish are stored on physical media, in physical retail packages! Everything we offer will be only available in strictly limited production numbers – no reprints. Strictly Limited Games. Let’s get physical! Strictly Limited Games brings you great console games for PS4 and PS Vita in strictly limited physical editions. We love games just as much as you do and we truly believe that games, as an art form, should be taken seriously and properly valued – that’s why we really need to have them preserved safely in physical form for future generations. Just pop the game into your console and enjoy – offline, any time, any place. Strictly Limited Games publishes games for PlayStation 4 and PlayStation Vita. We release only games that we love and want to play ourselves – including high quality collectibles such as art prints, soundtracks or other things that aptly suit the respective game. You will get these games on a disk/cartridge in a physical case, just like any other officially licensed game – but, as the name suggests, everything we offer will be strictly limited in terms of production numbers. We publish one title per month and we invite you to explore our website and to meet the lovely people behind these games there. Everything will be sold exclusively through this website. Therefore make sure to check out our website regularly or simply sign up for our newsletter and you won’t miss a thing.